A great selection of prepared crudities makes a healthy and stunning centerpiece for a party or buffet table. Mix and match according to the seasons and your taste. 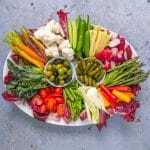 Here is everything you need to know to make a vegan platter your guests will love to eat! Serve arranged carefully on a pretty platter. Nutrition is approximate and will vary according to which vegetables you use. Values given for 125g, about one cup.